If you are finding footprints on your sealed hardwood floors, the culprit is probably an oily film on the surface. If you’ve tried to remove footprints in the past by using traditional hardwood floor cleaners and waxes, you are possibly making the situation worse by adding a dulling layer to your floors, making footprints and other marks more noticeable. The good news is it’s easy to remove with common household products you have in your home right now. Because the build up on your floors is causing the problem, you’ll need to get through that build up and back down to your floors. A mild acid – vinegar – does the job well. 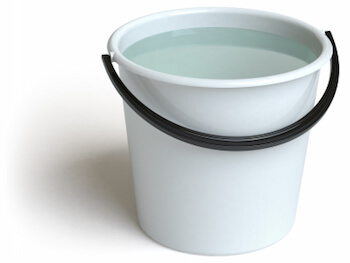 Start by mixing about 1 cup of vinegar per gallon of warm water in a bucket. Wet your mop or soft cloth into the solution, then wring out to remove all excess water. Wipe the surface with the vinegar solution, rinsing the mop/cloth frequently. Allow the wood surface to air dry. If there are any standing pools of water that won’t air dry quickly, use a soft cloth to remove the water. Test out your floor. If you still see footprints when you walk across the floor, you still have a build up on your floor, meaning waxes or other polishers have been used for some time. Repeat the process until all build up is removed, and your floors retain their natural beauty when you walk across them. Even floors that are treated with a polyurethane coating should not be exposed to standing water. Always use a damp mop, never wet, and wipe away any areas with pooling water immediately. If you have a lot of footprints, it can signal you have a higher concentration of build up. Use a stronger vinegar solution, and apply as many times as necessary to remove the build up. Be sure to allow drying time in between . Keep a small solution in a spray bottle for quick pick ups. Always avoid oil based cleaners on a sealed floor. Sealed floors do not need to be oiled or waxed. Simply cleaning them with a damp mop is the best way to keep them looking their best.